Join wellness expert Latham Thomas to learn how to reboot yourself with a complete audio program designed to help you get grounded, present, and centered; sleep better; and recharge your physical, cognitive, and spiritual reserves. What’s the single most important thing you can do to start each day with more energy, optimism, and freedom? Diet and exercise? Better time management? Sheer determination? For Latham Thomas, the answer is clear: reclaiming deep and truly restorative rest. With Beditations, this acclaimed wellness expert and voice of women's empowerment shows you how to reboot yourself with a complete audio program designed to help you get grounded, present, and centered; sleep better; and recharge your physical, cognitive, and spiritual reserves. Created for maximum benefit with minimal effort, this audio guide explains how to “punctuate your days and nights with ritual and a rhythm of moments to restore and heal.” Latham leads you through rejuvenating meditations and practices, plus a wealth of proven “life hacks” to boost your health, mental clarity, and productivity. 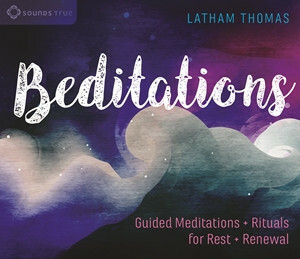 This information-rich learning experience features both healing daytime practices and calming nighttime sessions, each with Latham’s personal guidance. You'll also learn best practices, nightly rituals, and many other ways to boost your physical and mental energies, optimism, and productivity.